Ellie Stone, the heroine sleuth of this engaging, clever mystery, is a reporter for an upstate New York newspaper. It’s August 1962, height of the racing season in nearby Saratoga Springs, when Ellie happens on a fire at the abandoned Tempesta Farm, once a quality breeding place for Thoroughbreds. A barn has burned, which should have no particular significance, since it’s been years since Tempesta operated. 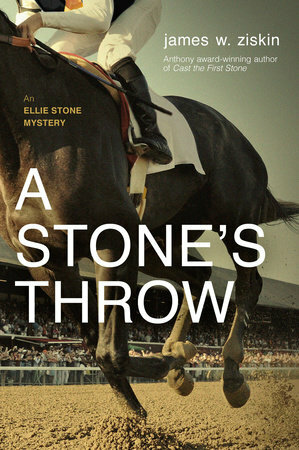 However, Ellie finds human remains in the ashes and a bit of racing silk that suggests the victim was a jockey. A bullet hole through the head confirms that it’s murder, which leads the police to suspect gamblers as the criminals. Ellie isn’t so sure, and, as is her wont, she pursues the case from every conceivable angle, like any good reporter; for about a week, she seems never to get any sleep. Knowing nothing about racing, she relies on a good friend to teach her, whereupon she drops the nuggets she’s learned into conversations with gamblers, horsemen, and racetrack swells, often with comic results. Ellie befriends a beautiful, temperamental horse named Purgatorio, and crosses paths with hoods who have no beauty but plenty of temperament. Her allies in the police department worry about her, especially the closer she gets to the truth, and the more heat that results. Ziskin tells his story with brisk economy, and despite a large cast of characters, he never loses you. That should be a given, but I’ve read many mysteries in which I’ve had to stop and say, “What just happened, exactly?” Yet the clarity never reveals too much, and the solution to the mystery comes as a complete surprise — another quality that eludes some authors. With all the grace of a punch-drunk prizefighter stumbling to his feet on the count of nine, the coroner pushed himself up off the muddy ground with both arms and a couple of grunts. Vertical once more, he coughed himself red in the face. After several restorative breaths, he wiped his hands on a cloth, which he tossed aside like a soiled tissue. Someone else would clean it up. Or maybe not. In no hurry to answer my question, he retrieved an Old Gold from a crumpled package in the breast pocket of his jacket, flicked his lighter, and puffed smoke into the air. As for historical flavor, I would have liked more than random details of dress, popular music, or news headlines. To his credit, though, Ziskin involves social issues hovering on the mainstream horizon in 1962. I particularly like how he handles the office politics, which conveys both background and contrast. Ellie has an assistant, an older woman with a developmentally disabled child, who does a lot of the spade work, for little money and no recognition, except from Ellie. The younger woman, educated at Barnard and blessed with the more glamorous, better-paying job, realizes how unfair this is. However, her status cuts two ways, for Ellie endures the sobriquet of “girl reporter,” symbolic of the hostility she faces on her beat and in the newsroom. Ellie never describes herself physically in her narration, but you get the idea that she’s very attractive, often more of a hindrance than an advantage. When an old-timer at the paper makes a remark about her derrière, she photographs his and posts the prints where other staffers can laugh at them. But it’s not all fun and games, for Ellie faces constant sexual harassment, and she fights an uphill battle to be taken seriously. Luckily, her editor believes in her reportorial skills— but nevertheless, she depends upon a man’s good graces. Also, Ellie’s Jewish, and Ziskin does a fine job portraying the shades of anti-Semitism she encounters, whether from the Saratoga blue-bloods or the underworld types. The blue-bloods also have no idea how racist they are toward African-Americans, even as they raise money to aid poor black schoolchildren. Properly, Ziskin never mentions the national movements or leaders campaigning for women’s rights or against racial and ethnic prejudice, a low-key approach that avoids earnestness or exaggerated significance. These are some of the pleasures of A Stone’s Throw, an excellent, satisfying mystery. Even readers who don’t remember the early Sixties will enjoy it. Disclaimer: I obtained my reading copy of this book from the publisher via Historical Novels Review, in whose pages this post first appeared in different, shorter form.